We’re not going to speculate on the cause of the recent crash of AirAsia Flight QZ 8501. It’s simply too early in the investigation to make any informed judgment. On the other hand, we will admit that among possible causes, the inclement weather in the area might well have been either a causal or contributing factor. Oddly, one of the most horrific weather related air disasters I can think of actually took place during what was an essentially beautiful day. BOAC Flight 911 was a Boeing 707 departing Tokyo bound for Hong Kong. Shortly before take-off, the crew had requested a visual departure that allowed them to fly in the vicinity of Mt. Fuji before they would enter the controlled en route airways. As the doomed plane taxied out to its departure runway, the crew and passengers actually passed the wreckage of a Canadian Pacific DC-8 that had crashed on landing the night before, killing 64 passengers and crew, with only 8 surviving. As BOAC 911 neared Mt. Fuji shortly after takeoff, the vertical stabilizer sheared off and struck the port horizontal stabilizer. The loss of the vertical and port horizontal stabilizer induced a sudden, strong yaw movement in the aircraft, which lead to all four engine pylons failing and shearing off. In the resulting flat spin, eventually one wingtip and the forward fuselage failed and separated from the aircraft. The aircraft plummeted to the ground. All 124 souls aboard were lost. What could have caused the sudden failure? Post crash analysis determined that the structure had been in good repair* and that an outside force had acted upon it. When fast moving air hits a mountain like Mt. Fuji, some will flow around the sides of the mountain. But some will move directly over the mountain, and down the far side. Indeed, a “rebound” wave will form further downwind. The determination of the investigation was that BOAC 911 had encountered this mountain wave, or lee wave and the sudden gust had exceeded the structural strength of the aircraft. Though one wasn’t present on the day of the incident, one tell tale sign of a strong mountain wave is the lenticular cloud. The air flowing over the mountain accelerates, causing lower pressure, and the resulting lower pressure often results in cloud formation. 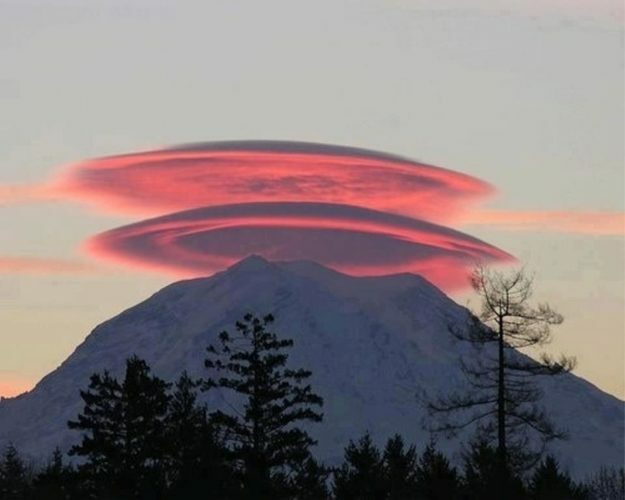 Though lenticular clouds themselves are relatively stationary, they’re indicative of high wind speed. In the wake, no pun intended, of this accident, procedures were changed to minimize the exposure of transport aircraft to possible mountain wave risk. Still, before the rudder actuator fault was located in early model 737s, it was at one time suspected in the crash of United Flight 585, and is still suspected in the in flight loss of an engine and pylon of an Evergreen International cargo 747 in Alaska in 1993. *Mostly. There were some stress cracks found in the vertical stabilizer structure, but not sufficient to cause the failure. The rest of the 707 fleet was inspected, and similar cracks were repaired.